The Simultaneous Interpretation System is also micro-processor controlled. Offering the user considerable flexibility in operating procedures. Channel routing can be preset or be under the control of the interpreters, and the interlocks between channels can be varied. The system can be portable or fixed and the interpreters desks comply with ISO and IEC Standards. Cabling is greatly simplified and the system connects on a bus principle using only and audio cable and a data cable.Wireless distribution systems are more suitable for multi-purpose venues where the furniture is movable. The Infra-red System offers more channels, better audio quality, and since the radiation can be confined it is particularly suitable for venues with divisible rooms or where multiple systems are in use in close proximity. It does, however, require the fixing of emitter panels in the ceiling or around the walls of the room. High security, without external interface. Automatic level control function (AFC). Easy to operate and save in project cost. With the most advanced MODEM technology. Elegant configuration in accordance to ergonomics. Self-test function, 6 kinds of testing voices for system test. 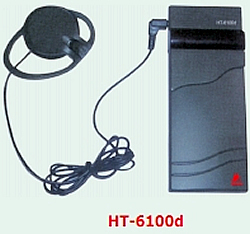 6CH uses the same IR Transmitter. 15W and 25W IR Transmitter. Voice adjustable and with feedback prevention. In case the interpreter does not understand the speaker’s language, he could switch to other channel to listen other interpreter’s voice and then interpret it. Delegate speak too fast, give request to “slow” speed. Automatic numbering on system units. One interpreter’s unit can be shared between two interpreters. Smart configuration and modern style appearance conforms to ergonomics. Rechargeable battery, 40 hours working time. Equipped with earphone / volume control. Receiver units has no limitation within IR radiation range.